Used in 32 recipes at an average of 2.407%. 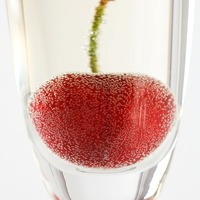 TART CHERRY is a bight tart and thin cherry that works in a beverage mix . Ice wine is a type of dessert wine produced from grapes that have been frozen while still on the vine. This allows for a more concentrated grape juice to develop. The grapes' must is pressed from the frozen grapes, resulting in a smaller amount of more concentrated, very sweet wine . INW SPARKLIG WINE is a brighter grape and has a syrup finish that coats and lingers which is characteristic of a an actual ice wine. INW TWO APPLES The apple sits in the middle in this mix. it is an accent note as many white wines have an apple note that is even more concentrated in an ICE wine. This note builds off the apple note in the sparkling wine. CAP TART CHERRY is used for a light tart cherry finish that lingers , and helps to contrast some of the sweetness in this mix and I really am enjoying its use in this mix. NOTES this is sweet but if you are looking for a more I would use a drop of two of CAP Super sweet. I tried this mix with VT ICED grape and I just did not care for the koolada effect i was getting and prefer this much more with WS 23 if that is something you would prefer. I made this Vampire Holiday as a part of Jennifer Jarvis's Fantasy Mix series pt2. Pretty simple shake and vape that tastes like Cranberry sprite. I chose Tart Cherry by Cap and Pinkburst by JF to build a more rounded note around Capella's Cranberry as it's flavor presence is somewhat weak in my opinion and I didnt want those notes over powered by Lemon/lime citrus notes. If you like beverage flavors, this recipe might be worth checkin out.